The winter-end and beginning of Spring 2011 comes with a bunch of cool concerts at the Betong venue which belongs to the Norwegian Students organisation. These events go under the name of South of Heaven and the first night had Nile as headliners, 3 more bands on the lineup and it ended up with an extra band playing in between (Pressure Points). The evening started right on time, as opposed to most of Oslo concerts that tend to start at least half an hour after the doors open. Hence, when I entered the venue, Goat the Head was already on stage and I only witnessed their last song. And how sorry I can be. I was told the day before that they are a great live band and insane people, which was exactly the first impression you get when you see 3 dudes on stage dressed in orange suits, bare footed, some white paint on the singer's face and belly and a drummer who specialises in making silly faces. The song they used to end their short setlist was 'Mother Horse' in which they blended a riff from Beastie Boys' Sabotage for extra entertainment. I do recommend you give a listen to their 'Contemporary Primal Caveman Death Metal'. Up next was the unlisted band, Pressure Points, from Finland. They had also a short list during which they played something in the range of melodic/progressive death metal who caught my attention every now and then either by some cool key lines, or a nice blend of drums and guitar interlude. But almost after every song they mentioned that they have sound problems and it could be felt in their 'mood', quite tense and nervous. Which makes a band less appealing for me. But some 'first liner' fans were entertained and I recall they seemed to have rather long songs. Another speedy instruments changeover and checkup, some banners on each side of the stage, two horns on the middle microphone stand and then 4 men wearing black suits (or at least the coats) made their appearance. 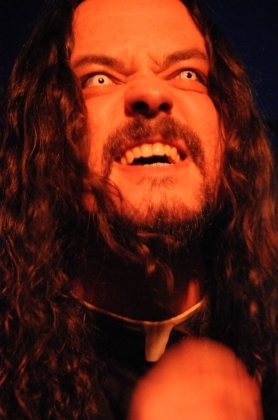 Bonus for the singer having white contact lenses, making his looks more evil and dramatic. Bibleblack is a Swedish band formed by by King Diamond/Mercyful Fate guitarist Mike Wead and Memory Garden/Abstrakt Algebra guitarist Simon Johansson, hence you can maybe imagine that their only album so far, 'The Black Swan Epilogue', is somewhat in the style of the aforementioned artists, dark and heavy. Noticeable riffs and stage presence that caught the attention of the increased amount of crowd (compared to the previous bands at least). The peak point was when they announced they'd do Mercyful Fate covers, convincing everyone to come closer to the stage and sing along. A person in the audience even got to thrill us with their hailing Satan scream on 'Dark funeral'. I really have to give some pluses to the stage crew who makes the changes between bands go incredibly fast. Therefore, after a little while we see a carpet laid down on the floor, an incense stick lit up, it all goes pretty dark and prepares the entrance of the Israelians from Malechesh. With their guitarist, Moloch, looking like a ninja, while the vocalist has all sort of mystic bracelets and talismans on his arms or hanging around his neck. I was very quickly in love with the mysterious and melodic sound of their black metal, while the 'Summerian' look of the singer/guitarist was absolutely perfect for their self described Mesopotamian metal. He had a short guitar solo where he used a drum stick instead of a pick for a change. There's a whole load of occult in the atmosphere, the crowd loved the 8 long-songs playlist and you could see a lot of horns up in the air raised for deities such as Baal, Shamash or Nineveh. Cool ambiental metal on the background making the transition to the Nile set smoother. Lights go off, the rhythms of Kafir start puring through the speakers and band members come on stage, continuing the mysticism of the dark evening by taking us into the realm of Egyptian myths and history. I wasn't familiar with their music, I was previously told that they have an incredible (Greek) drummer. So I have to admit that the music was not my first point of interest. 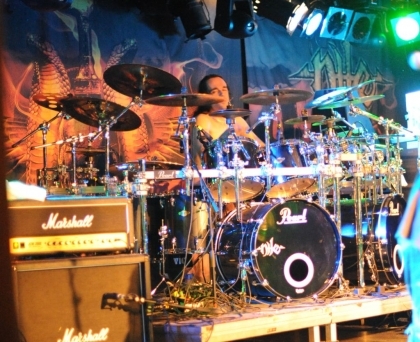 I got really fascinated by the amount of cymbals and toms that were part of the drumkit and by how the tiny drummer (Kollias by his name) kept hitting them all. And after few songs I realised that it's practically impossible to watch his movements, so I switched to watching the cool guitar skills of Karl Sanders or of the bassist Chris Lollis. Whose hair was quite impressive as well. There were tiny sound issues along their set, but the experienced musicians got easily over it and showed their appreciation to those present in the crowd by reminding that regardless of one's origins, we all speak the same language of metal (or maybe just death metal, can't recall exactly). One guy in the audience even knew the foreign language of crowd surfing, which I don't think was too liked by the security guys. All in all an enjoyable evening which makes me look forward to the future events from the 'South of Heaven' series.